Skip James 1931 DOCD-5005. Skip James had just one pre-war session and turned out an astonishing 18 sides, thirteen with guitar and five with piano, for the Paramount label at their Wisconsin studios. Here, in their entirety are the results of that session including I’m So glad a remarkable masterpiece, later covered by the sixties super group Cream, with its simple lyrics accompanied by incredibly fast and accurate finger-picked guitar. 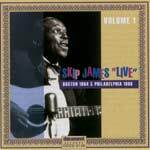 Skip James Live Volume 1- Boston 1964 & Philadelphia 1966 DOCD-5149. The first of 3 CD`s featuring Mississippi Delta bluesman Skip James in concert after his re-discovery in 1964. Skip James Live Volume 2 - Bloomington 1968 Part 1 DOCD-5633. The second of 3 CD`s featuring Mississippi Delta bluesman Skip James in concert after his re-discovery in 1964. The third of 3 CD`s featuring Mississippi Delta bluesman Skip James in concert after his re-discovery in 1964. DOCD-5634. Nehemiah Curtis `Skip` James was was born on Woodbine Plantation outside Bentonia, Mississippi on the ninth of June, 1902. Being raised on the plantation Skip James was interested in music early and had learned guitar by age 8. As a youth, Skip James heard local musicians such as Henry Stuckey and the brothers Charlie and Jesse Sims, and began playing the organ in his teens. After learning piano in High School, Skip James dropped out into the hobo lifestyle getting work on road construction and the levee-building crews in his native in his native Mississippi, in the 1920`s. What is thought to be his earliest song "Illinois Blues" documents his experiences as a laborer. In the later 20`s Skip James sharecropped, and made bootleg whiskey in the Bentonia area whilst playing at parties, roadhouses, jukes, and barrelhouses. Skip James began playing guitar in an open E-minor tuning and developed a three-finger picking technique that he would use to great effect on his recordings. In addition to this he began playing more piano, drawing inspiration from the Mississippi blues pianist Little Brother Montgomery. In early 1931 Skip auditioned for the Mississippi record-shop owner H.C. Speir and on the strength of this recorded his first session for the Paramount label in Grafton, Wisconsin. Seventeen tracks were laid down and these can be heard on Document Records DOCD-5006. These recordings are some of the most famous and idiosyncratic ever made in the blues genre. The track "I`m So Glad" had previously been recorded by both Gene Austin and Lonnie Johnson, but even so Skip`s rendition was totally original. As James` biographer, Stephen Calt explains "one of the most extraordinary examples of fingerpicking found in guitar music." Other pieces recorded at Grafton were of a similar high quality, such as "Devil Got My Woman," "Special Rider Blues," and "22-20". After this session Skip James recorded nothing for thirty years. Skip James was re-discovered in 1964 by blues enthusiasts John Fahey, Bill Barth and Harry Vestine in Tunica, Mississippi. The `re-discovery` of Skip James and Son House at vitually the same time heralded the start of the blues revival in America. In July 1964 James appeared at the Newport Folk Festival. He then recorded for the Takoma, Melodeon and Vanguard labels whilst playing concerts in the remaining years of that decade. Examples of these concerts can be found on Document Records DOCD-5149, 5633 AND 5634. Cream recorded a version of "I`m So Glad" taken from James` 60`s recording of a track that he had first played in 1931. Skip James died of cancer in Philadelphia, November 1969. Skip James stands as one of the most original of all blues performers, the haunting delivery of his falsetto singing set against his rythmic and erratic instrumentals.